A “may day”’ call this year came from the U.S. Department of Energy. The DOE made a $30 million funding commitment to long-term energy solutions through its Advanced Research Projects Agency-Energy (ARPA-E) office. “Long-term,” as defined in the project scope, starts at 10 hours and extends up to 100 hours of stored energy. Funding from the new program called DAYS (Duration Addition to electricitY Storage) is open to any technology able to meet siting, output, and cycle requirements. And the solution must deliver an average cost of 5¢/kWh cycle across the range of storage durations. The shift to renewable energy continues, despite uncertainty about the direction of U.S. policy under the current administration. ¤ Non-hydro renewable energy generation increased +15% in 2017 with wind and solar capacity reaching 143 GW, a 431% increase in the last decade. The anticipated growth reflects current commitments to cleaner energy by leading U.S. utility companies. ¤ Consumers Energy in Michigan: 40% renewable energy by 2040. ¤ National Grid in the Northeast: 80% reduction in carbon emissions by 2050 (vs. 1990). ¤ Xcel Energy in the Central U.S.: 40% renewables by 2021, 60% by 2030. ¤ Ameren Missouri: Increase wind power to 700 mw by 2020 and solar to 50 mw by 2025. ¤ Duke Energy in the Southeast and Midwest: 40% reduction in carbon emissions by 2030. ¤ Southern California Edison: 80% solar, wind, hydro power by 2030. ¤ American Electric Power in the Southeast and Midwest: 80% reduction in carbon emissions by 2050 (vs. 2000). ¤ MidAmerican Energy in Iowa: 95% renewable energy by 2021. ¤ DTE Energy in Michigan: At least 80% reduction in carbon emissions by 2050. ¤ First Energy in the Mid Atlantic: At least 90% reduction in carbon emissions by 2045 (vs. 2005). ¤ In April 2018, Apple shifted to 100% renewable electricity to power its facilities in 43 countries. ¤ Kellogg delivers 20% renewable electricity internationally and expects to achieve 40% renewable by 2020. ¤ Microsoft has been powered by 100% renewable energy since 2014. At the local level, California became the first U.S. state mandating solar panels on most new homes built after January 1, 2020. The requirement is part of Governor Jerry Brown’s pledge to reduce carbon emissions by 40% in the next 12 years. Importantly, the initiative fuels the continued growth of residential solar, helping it evolve into a building standard, and a practice adopted by other U.S. states. Not surprisingly, California is also a global leader in the use of energy storage. Although progress has been slower than planned, California represents about 90% of U.S. non-residential storage capacity. The scientific community echoes the confidence of utility and commercial companies in non-hydro renewable energy. A recent report shows 80% of U.S. electricity demand could be met with solar and wind power, according to researchers from the University of California—Irvine, the Carnegie Institution for Science, and the California Institute of Technology. To handle the variance in the availability of solar and wind, systems capable of storing several weeks of power would be required. Although lithium-ion batteries have benchmarked storage solutions, the capacity requirement outlined in the DAYS program opens the door to new technologies. ¤ Flow batteries, which produce an electrical current through an exchange of negatively and positively charged liquid, using non-explosive, non-flammable electrolytes, have emerged as a low-carbon footprint solution. The structure of flow batteries provides reliability — liquids can be stored almost indefinitely and activated quickly. And flow batteries are scalable — they can be produced in several sizes. ¤ Vanadium flow batteries are viewed by some as the frontrunner for energy storage solutions because of their reliability and battery life. But the cost is still one of the challenges facing lithium-ion alternatives like vanadium flow batteries. StorEn Technologies is in the process of validating its vanadium flow battery prototype with promising results. The company’s batteries provide energy storage for residential, industrial, and telecom/data center applications. Patented technologies in the StorEn battery help it deliver increased power density and roundtrip efficiency. The battery requires little to no maintenance with a patented leak system. And with a targeted cost of 2¢ per cycle, StorEn’s vanadium flow battery is a contender in the DOE’s storage program. The renewable energy economy continues to grow, spurred by commitment across sectors and industries. Falling costs of onshore wind and solar photovoltaic electricity have made these sources the most inexpensive new energy available, according to the International Renewable Energy Agency (IRENA). But storage is an acknowledged “must-have” with solar and wind to deliver consistent energy from variable power sources. 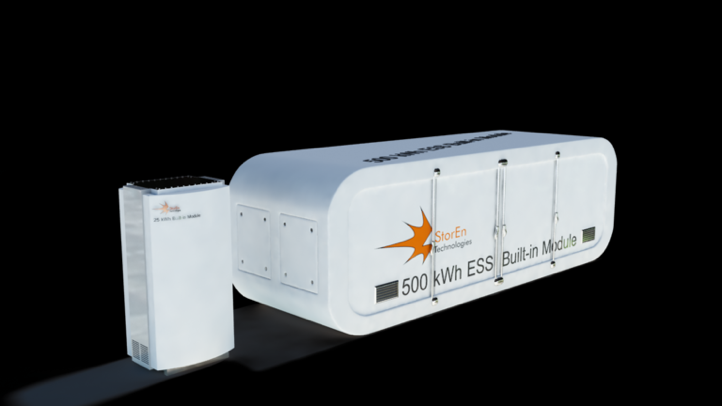 StorEn Technologies has answered the call for long-duration energy storage. If you want to be part of the storage solution, you can invest in StorEn’s technology via its equity campaign.